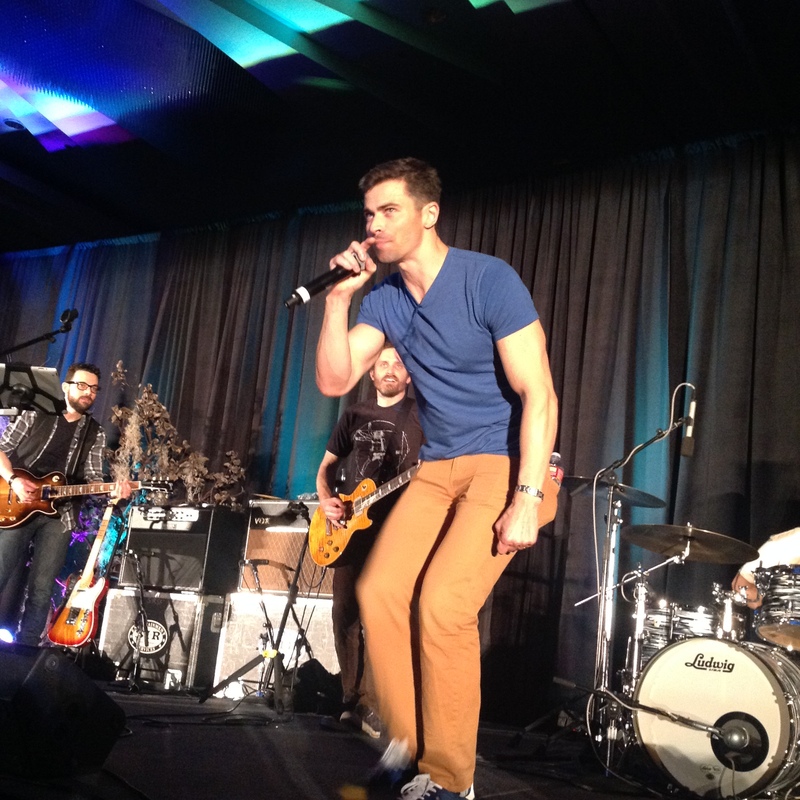 Supernatural Convention Commentary: What’s So Special About Saturday Night? 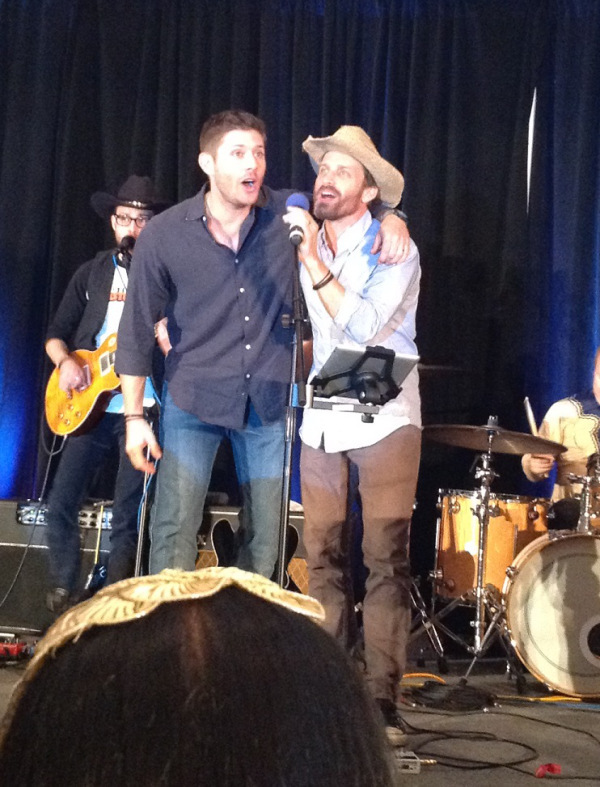 I sat down today to share some photos from HousCon and SFCon that didn’t make it into my other reports. When I realized that most of them were from the Saturday Night concert, I got to thinking. What is it about that event that makes it so special? (And inspires me to pull out my camera more than usual, even though I’m far from a photographer). This is the result. Call it ‘the evolution of the Saturday Night Special’ if you will. Since we began our crazy road trip through Supernatural fandom eight years ago writing Fangasm Supernatural Fangirls, we’ve seen both the Show and the fandom evolve. The Show has had its ups and downs, but there has never been a time that I didn’t love it and have faith in the talented people making it. The fandom has had its ups and downs too, with countless examples of fans supporting each other and unfortunately some examples of the opposite, though I still think the former far outweighs the latter. The cast, too, has had its ups and downs. For eight years, many of the actors have done conventions together, travelling the world and sharing an experience few people get to have. Although many of them never even worked together on the Show, they have all become closer than cast members usually do as a result. 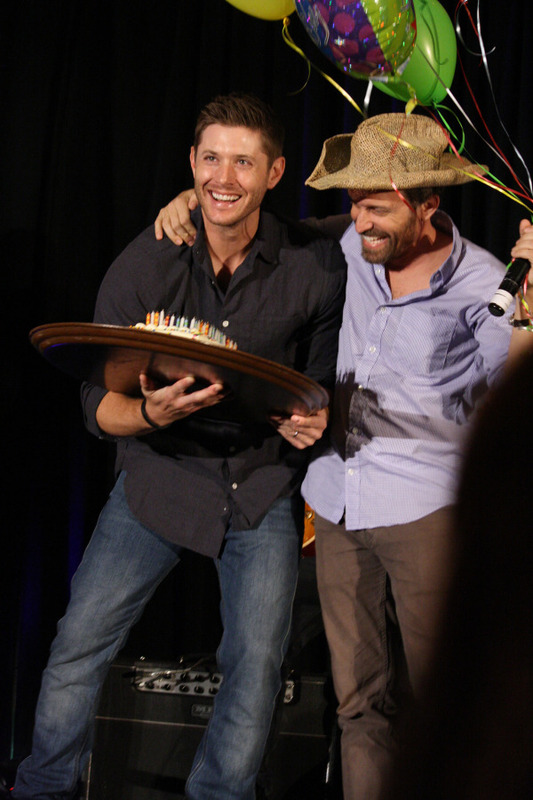 That all became very clear when Rob Benedict suffered a stroke at the Toronto convention in 2013, and his fellow Supernatural actors saved his life. Literally. Word got out, and fans began to offer their support. Donations to stroke prevention foundations poured in, and fans waited to see if Rob would return to the conventions. 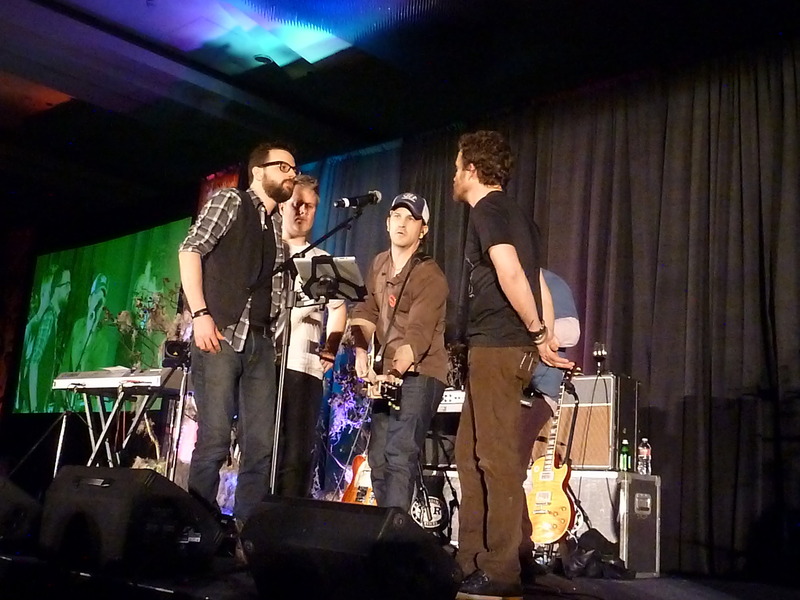 By that time, Rob and Louden Swain had become a fixture at the cons, and we all looked forward to their shows. 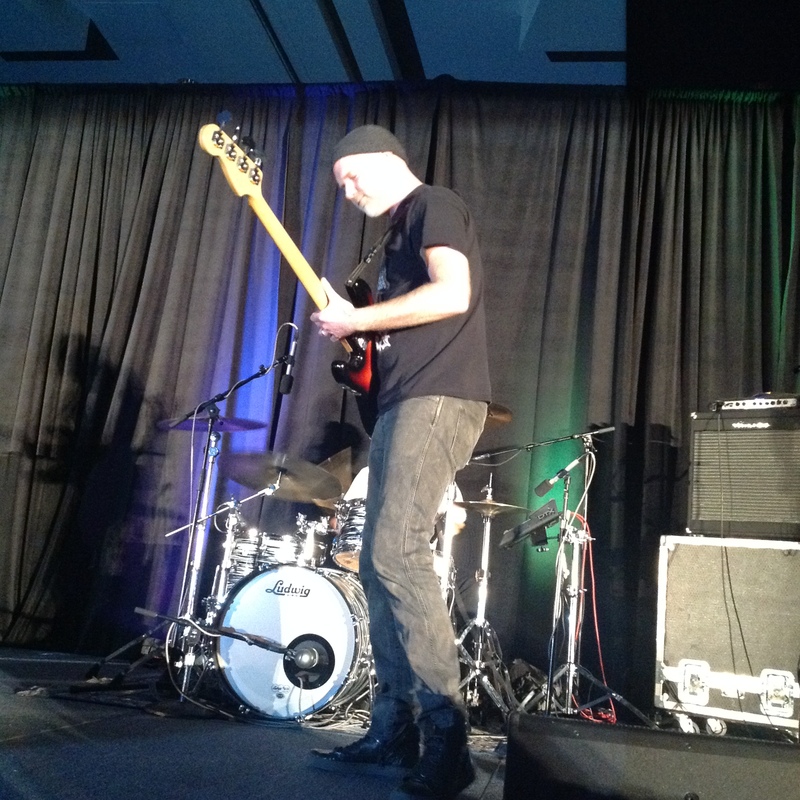 At the Burbank con a month later, Louden Swain was scheduled to perform, but Rob wasn’t well enough to play. But did that cancel the Show? No way. 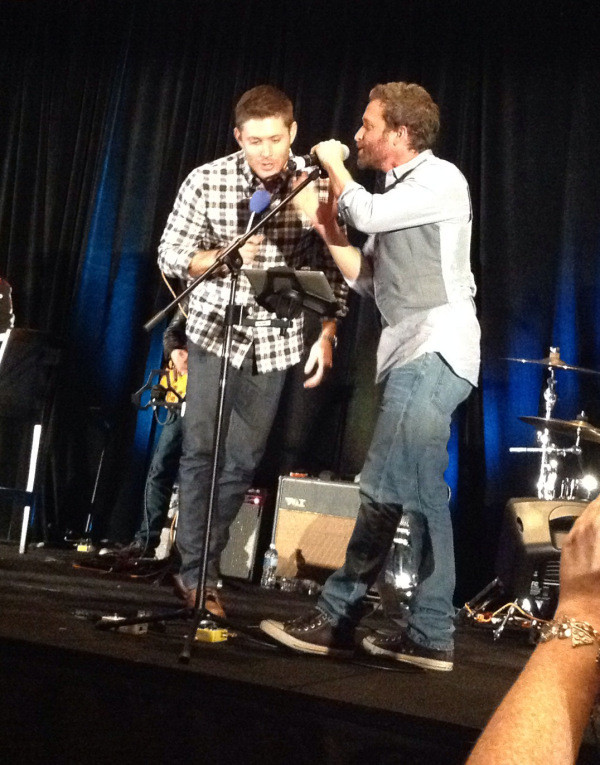 This is Supernatural – as Jared and Jensen have both said recently, the theme of the Show is never give up. So the other guests stepped in. Rob came onstage briefly to explain what had happened, and to thank his fellow actors and the SPNFamily for saving his life. 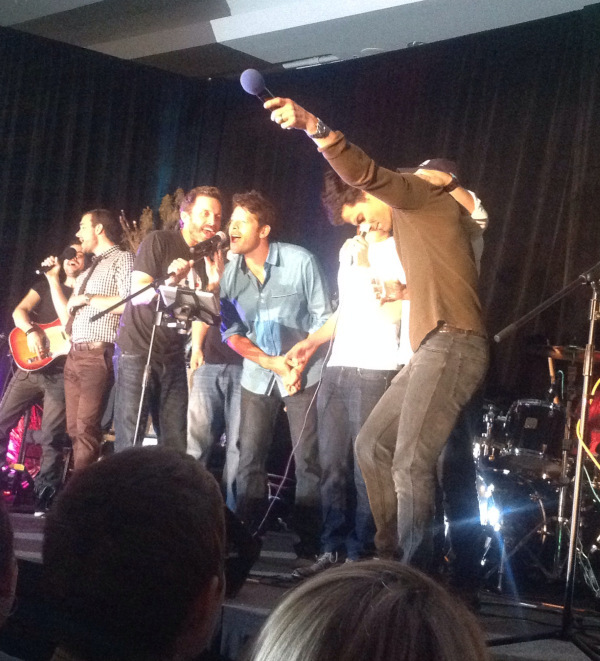 Then his friends took the stage while the room full of fans cheered. Many cried, hearing what had happened for the first time and overwhelmed with emotion. The show that night was a family affair. 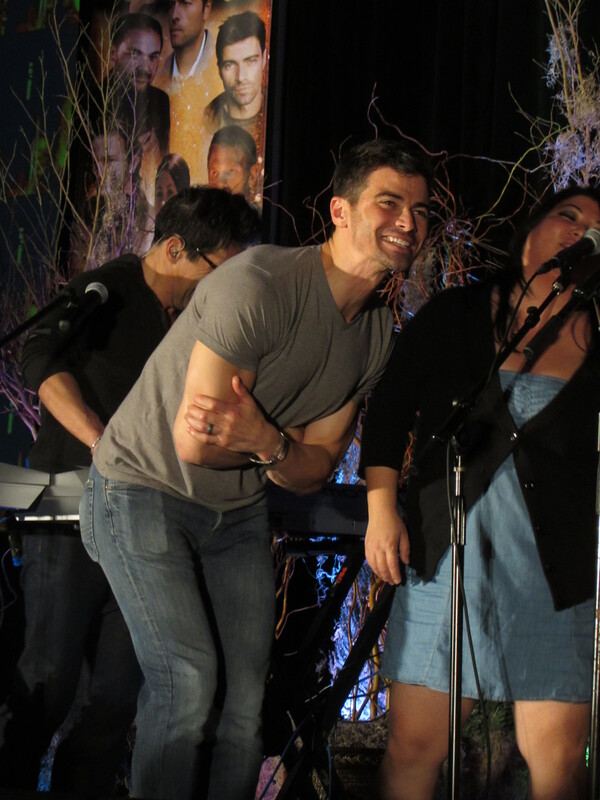 Matt Cohen and Misha Collins emcee’d. 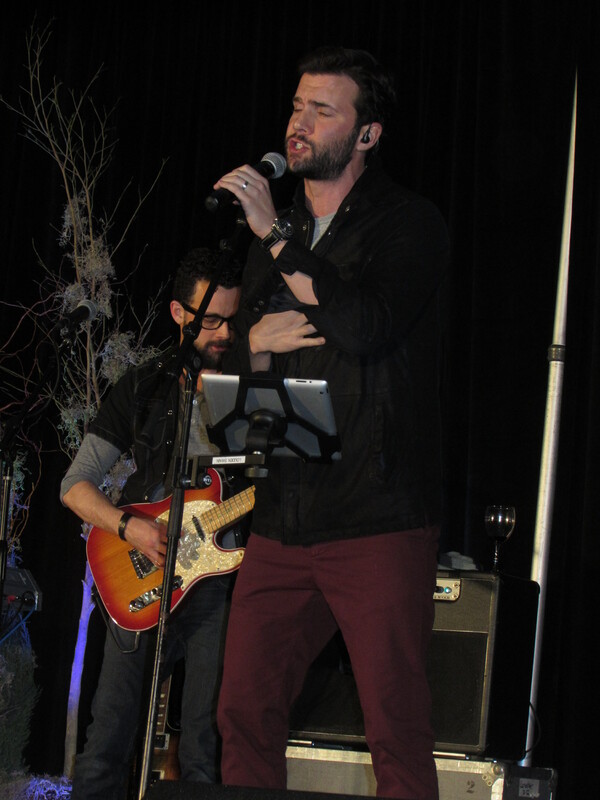 Jason Manns stepped in as front man for Louden Swain to sing many of their hits. 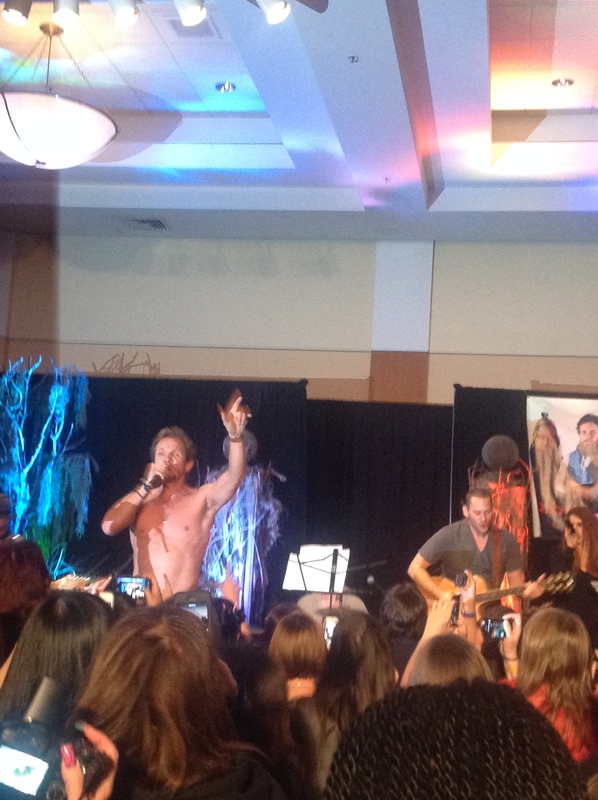 Sebastian Roche belted out ‘Eskimo’, my favorite Louden Swain song – he, of course, performed it shirtless, which I have yet to see Rob do. 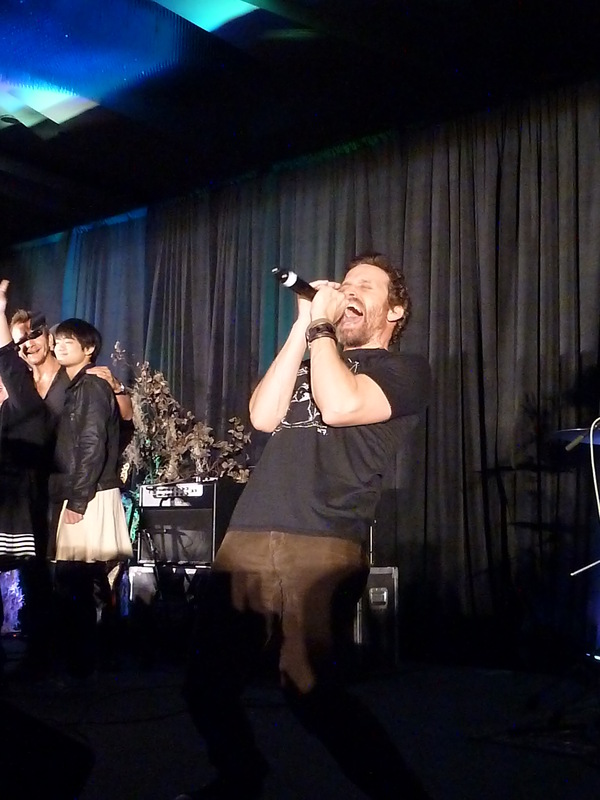 Mandy Musgrave (Matt’s wife), Julie McNiven, Richard Speight and Brian Buckley each took a turn at the mike. 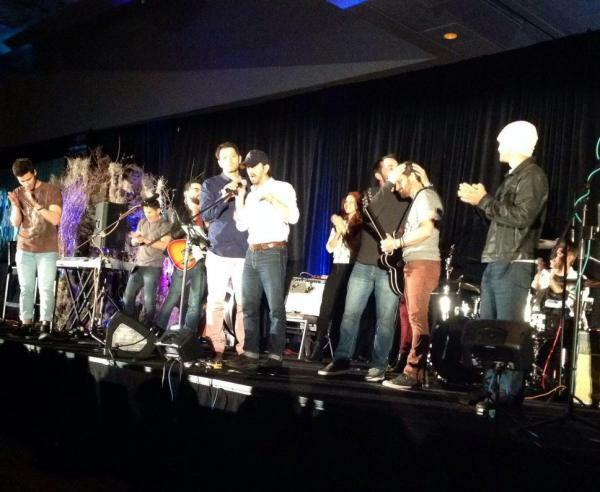 And to end the show, the cast and the fans all sang Supernatural’s more-or-less-official anthem, ‘Carry On’, in a moment of solidarity with Rob – and with each other. 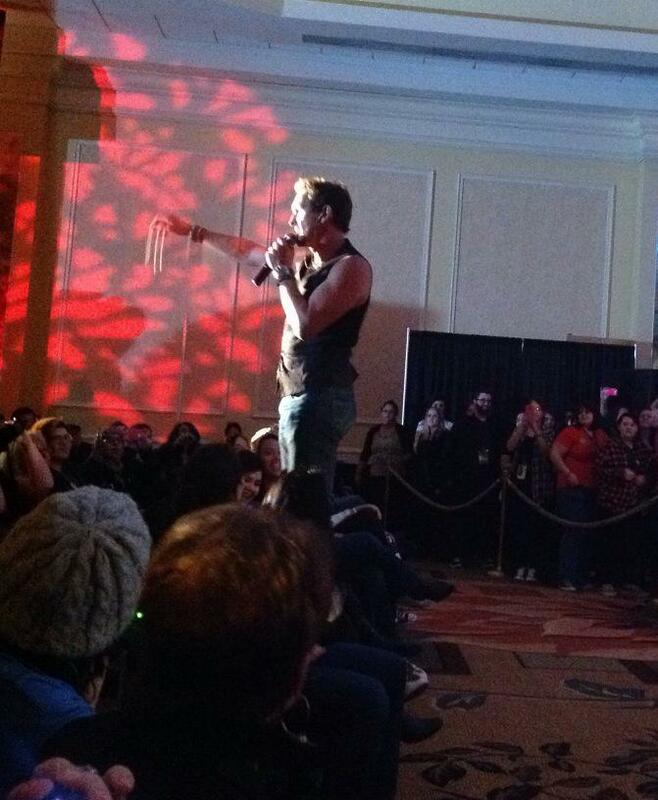 Sebastian sings shirtless. Of course he does. With a beginning like that, it’s no surprise that the Saturday night concert is always an emotional highlight of the conventions. After struggling to find a good way to bring fans and cast together on Saturdays (does anyone remember the ‘dessert party’?? We used to call it speed dating with the stars, since fans sat at tables and the guests went table to table to say hi, awkwardly trying to make conversation for what felt like thirty seconds before they had to move to the next one…), Creation eventually hit upon an event that’s now one of my favorite parts of the con – with some help from Richard Speight and Mark Sheppard. Richard transformed karaoke from a bunch of fans hanging out in the bar to something special. 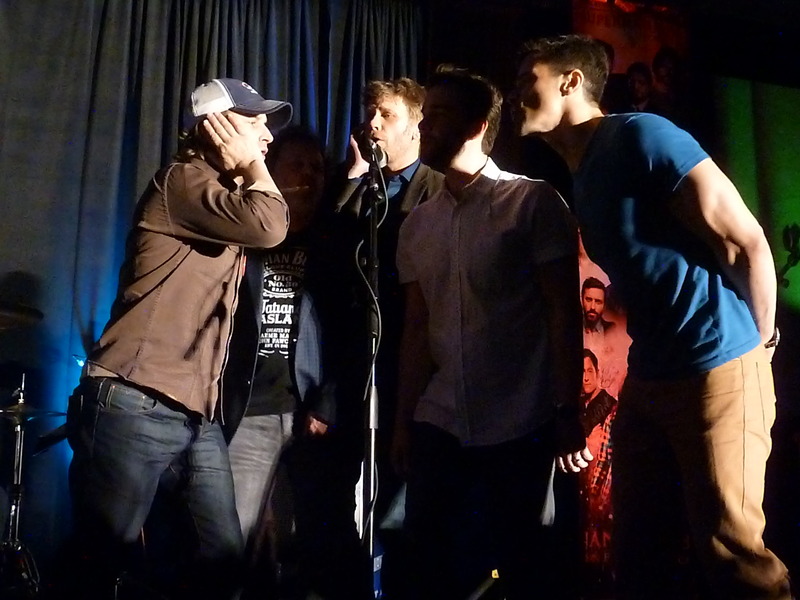 He talks about the night he and Matt changed karaoke forever in his chapter of Fan Phenomena Supernatural. Moments later, when we all took the stage, I grabbed the mic and said, “I know that Creation’s rules say you gotta stay in your assigned seat, but I say, ‘F*ck the rules!’ This is our show and we want you all front and center – right now!” The fans in attendance exchanged glances – Can we really do this? Will they throw us out? Matt got the ball rolling by jumping off the stage and using his rippling torso to move chairs out of the way to create space up front. After a moment or two, the fans came down. Timidly, but they came. And suddenly, subtly, the change began. The energy was different. It was more relaxed. People sang. People cheered. People danced. We danced. . The separation between actor and fan began to dissipate. And afterwards, people talked and tweeted and told others about what happened that night. And word began to spread. 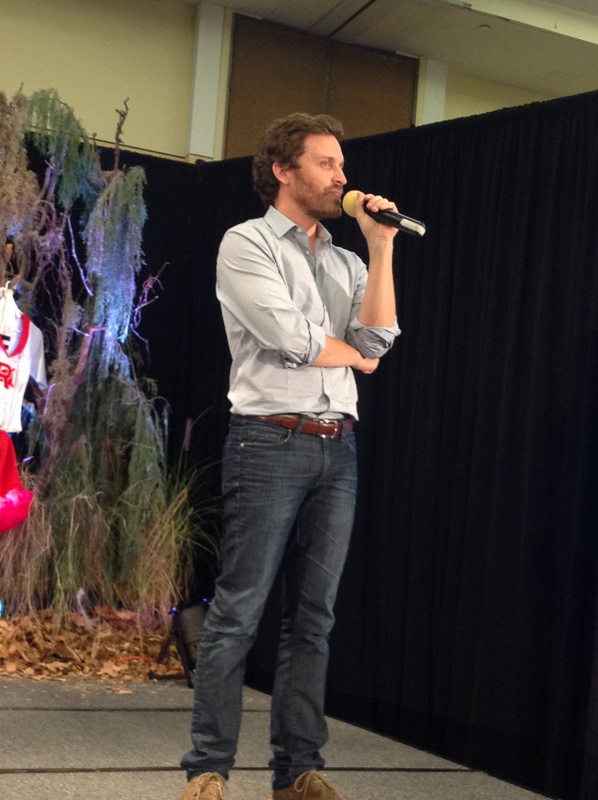 By the next convention, VegasCon 2014, Rob had defied expectations and was back onstage, close to 100%. 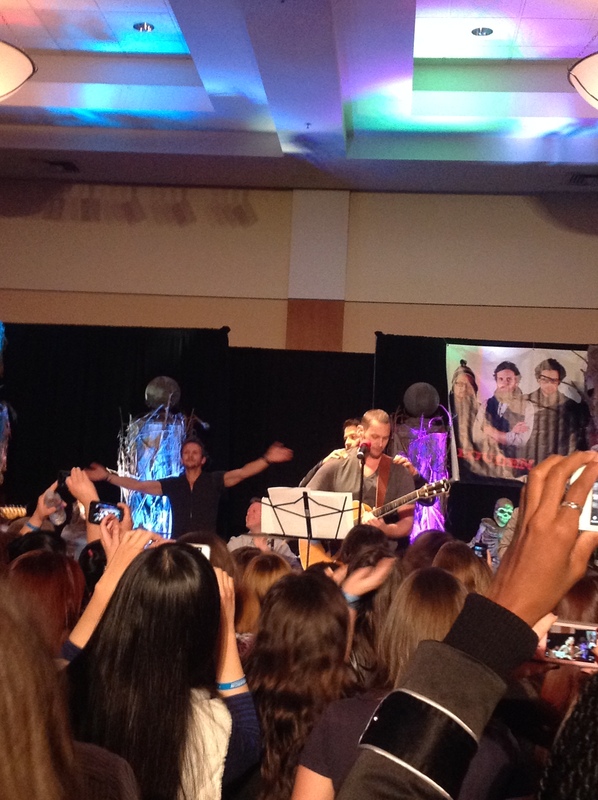 Fans welcomed Rob back with a video of “What I Like About You”, holding up messages of love and support set to a background of convention videos and scenes from Supernatural. By the time the vid was over, Rob was tearful onstage and there was not a dry eye in the audience as he told the fans how much their support had meant to him as he recovered. 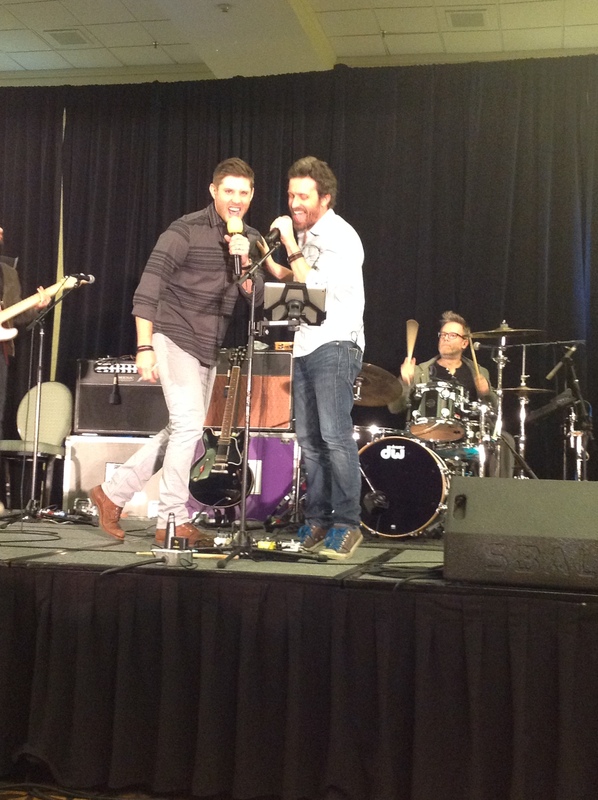 Near the end of the con, Misha Collins came out onstage to express his feelings about Rob being back too. As he spoke, you could tell how much emotion he felt seeing Rob well and healthy again, and how devastated the cast had been by almost losing him. It was a reminder that the actors are SPNFamily as much as the fandom. 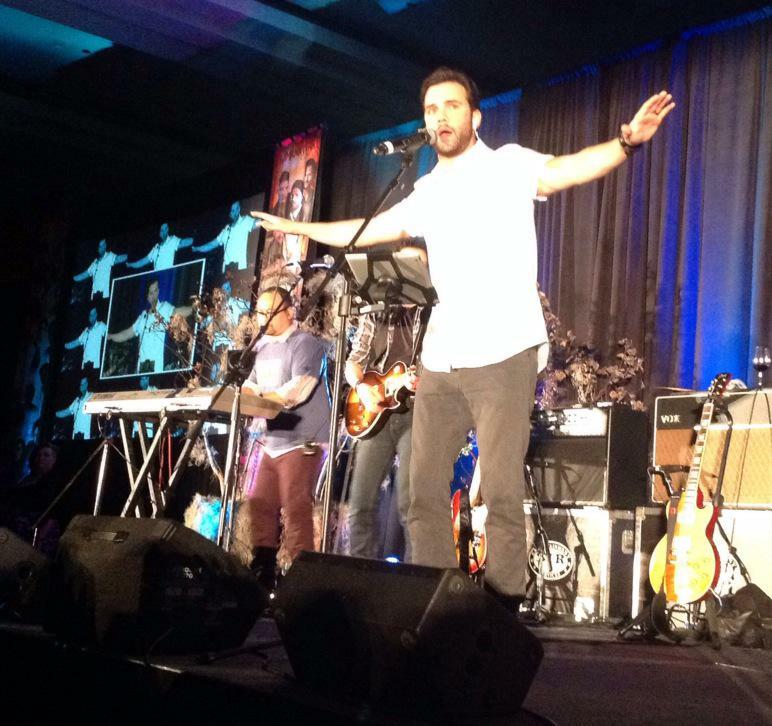 Louden Swain played an amazing concert on Thursday night and then the band stayed onstage all weekend. 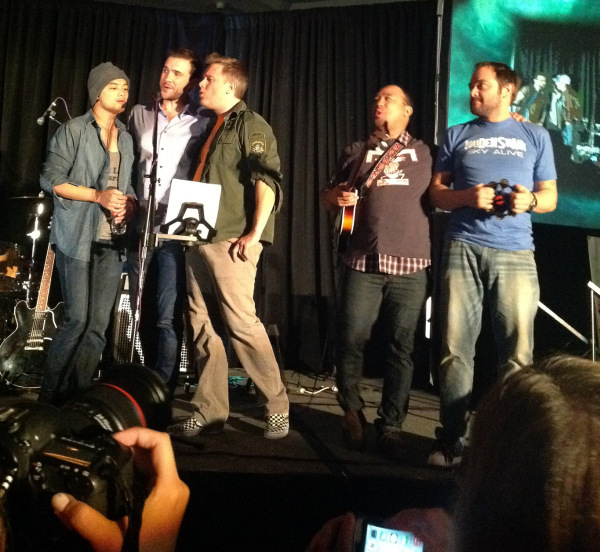 This was the first time we had a “house band” at a convention, and it upped the energy level by 200%. 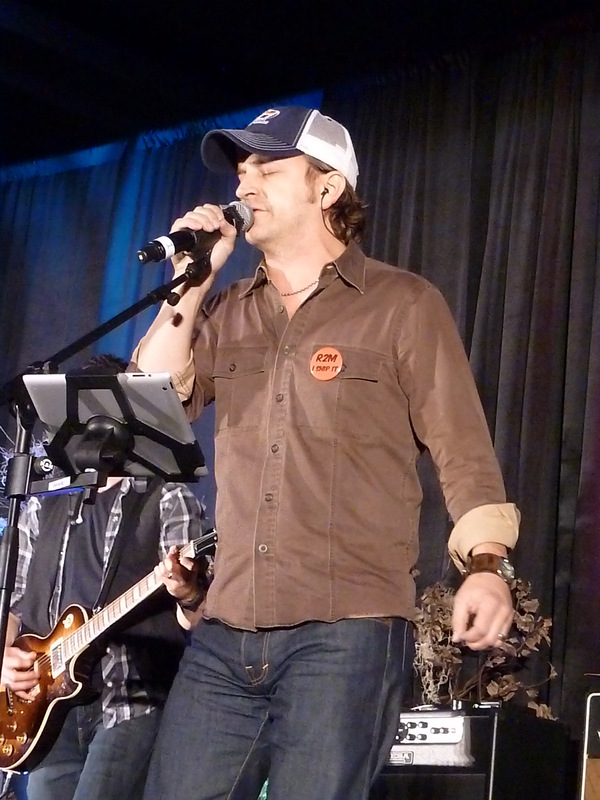 We had drinks with Richard Speight after the con, reminiscing. (We took Richard to his very first Louden Swain concert a few years earlier). 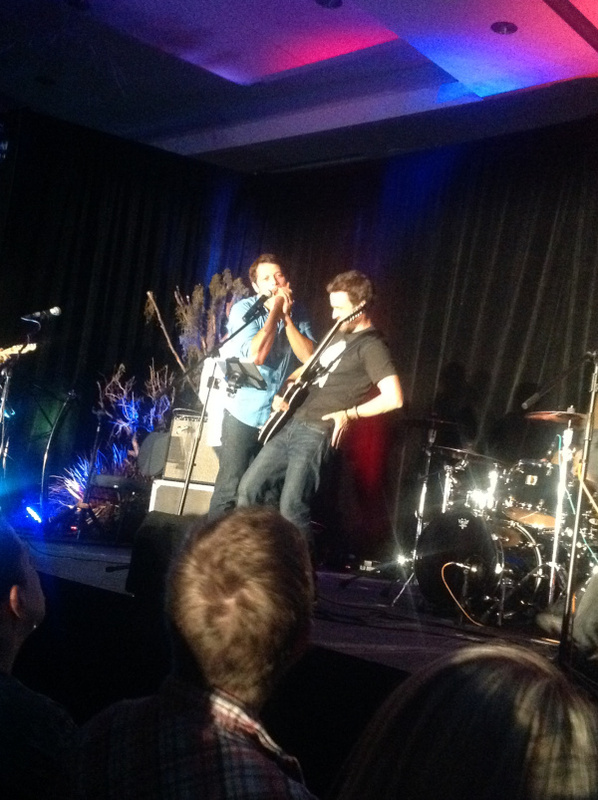 Now we wondered how they could ever go backwards and have a con without Louden Swain as house band ever again. Richard shook his head. “How do you put the toothpaste back in the tube?” he asked. 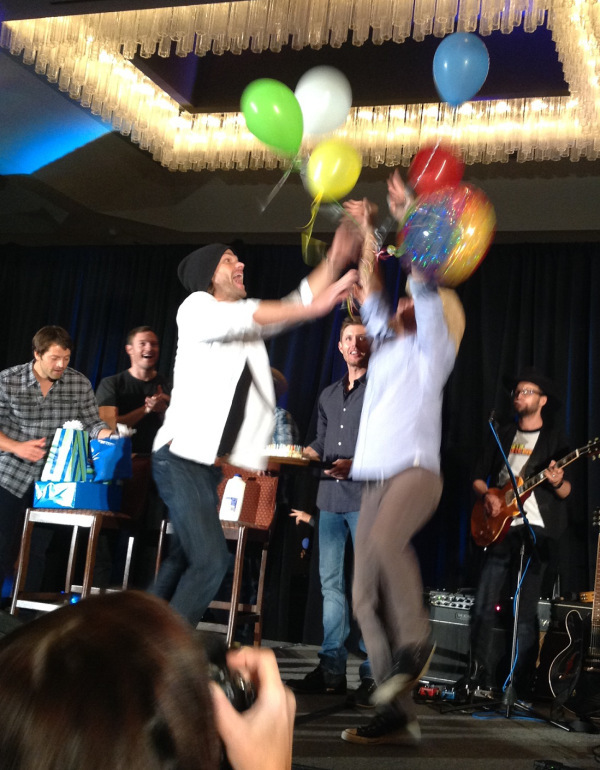 At DallasCon that year, the cast celebrated Rob’s birthday onstage, Jensen surprising him with a giant cake and Jared with balloons. The affection and relief, and the closeness between them all, was evident. There’s something about almost losing someone that makes you realize just how important they are to you – and if you’re smart, gives you time to make sure you start showing them. I think the Supernatural cast has done just that. 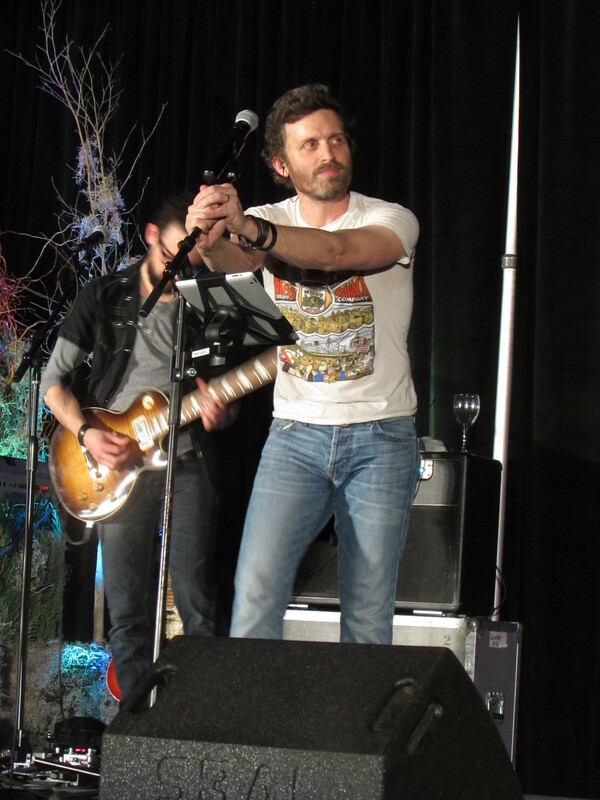 By the time Toronto Con rolled around, the one year anniversary of Rob’s stroke, we had an answer to Richard’s question about putting the toothpaste back in the tube. You don’t. That Saturday night, instead of a dessert party or a cocktail party, we had a concert. 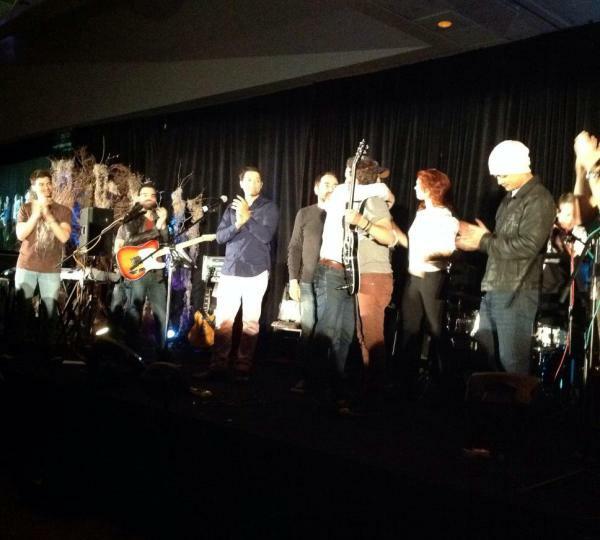 Not just a Louden Swain concert, but a show in which many of the Supernatural actors took part, their performance showing support for Rob and for the fans who have supported all of them. 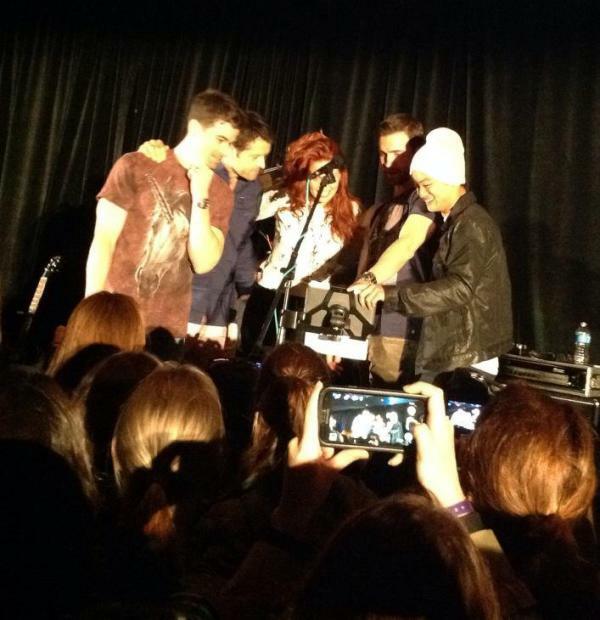 By the time the rest of the cast joined him onstage, everyone was emotional. For some of the other cast members, giving a musical performance was way out of their comfort zone, and something they could only do because they felt so accepted – by their fellow cast members and by fans. 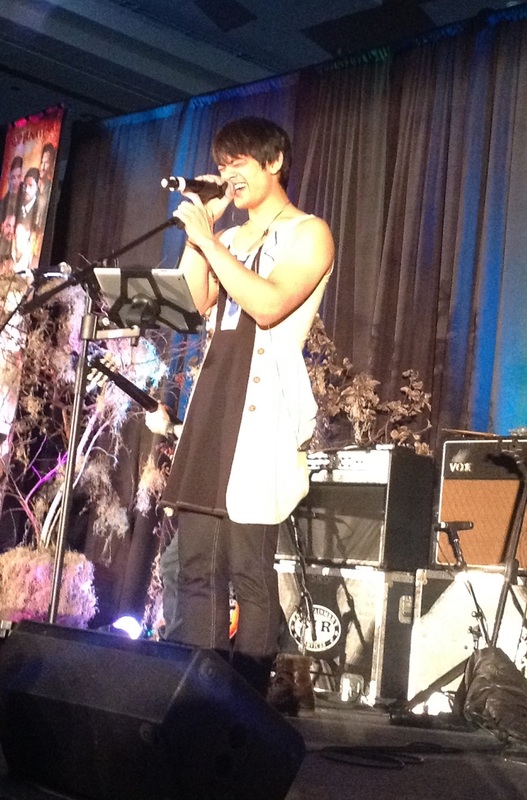 We sat down for a chat with Osric Chau right before the first time he challenged himself to sing and play guitar in front of an audience at a convention, so we saw firsthand how nervous he was. 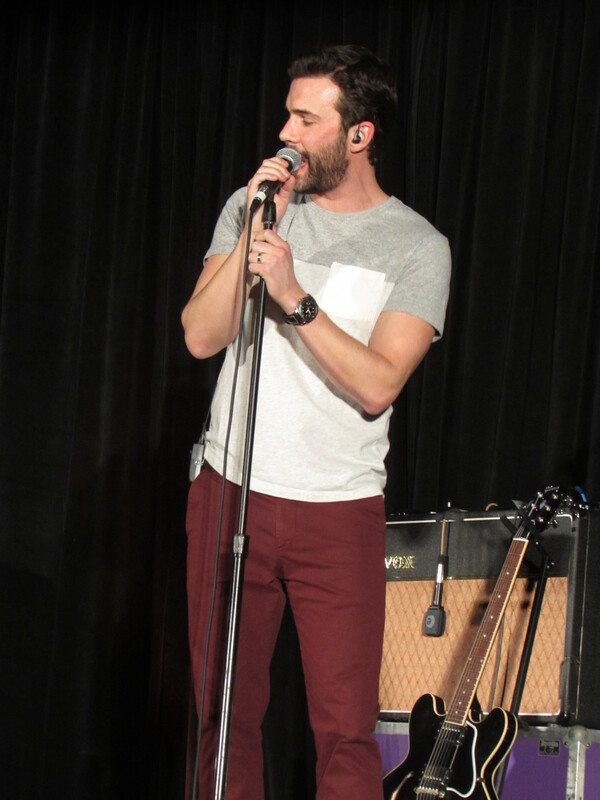 At Toronto, he stepped up to the mic and began singing Radiohead’s ‘Creep’. It’s one of my favorite songs, and from the crowd’s reaction, many people agreed. 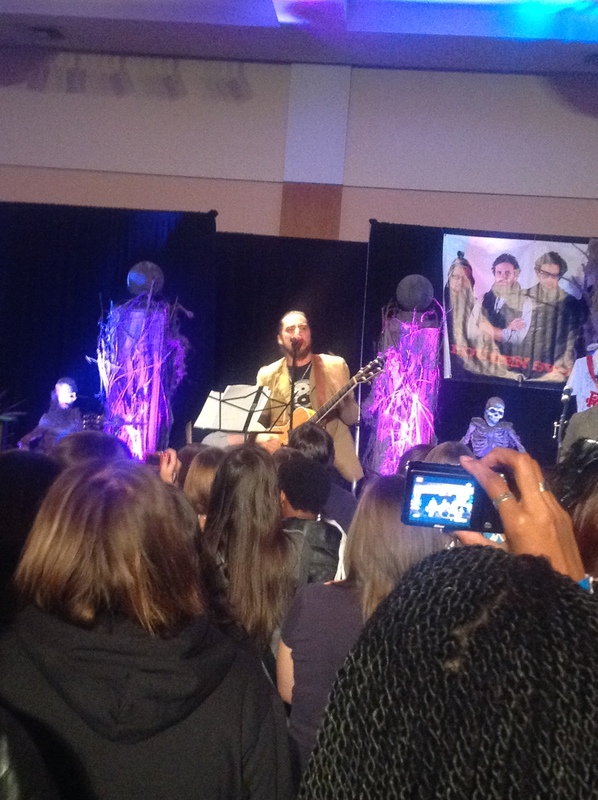 We wrote a lot in Fangasm: Supernatural Fangirls about the feeling of being an outsider, a ‘freak’, of not quite fitting into the mainstream, that so many people in fandom have experienced. It might be all sorts of things that made you feel different, but the feeling is the same – and that song captures it. There’s so much self doubt and pain, so much longing for acceptance, in that song, and the way Osric sang it let us all know that he has felt that too. 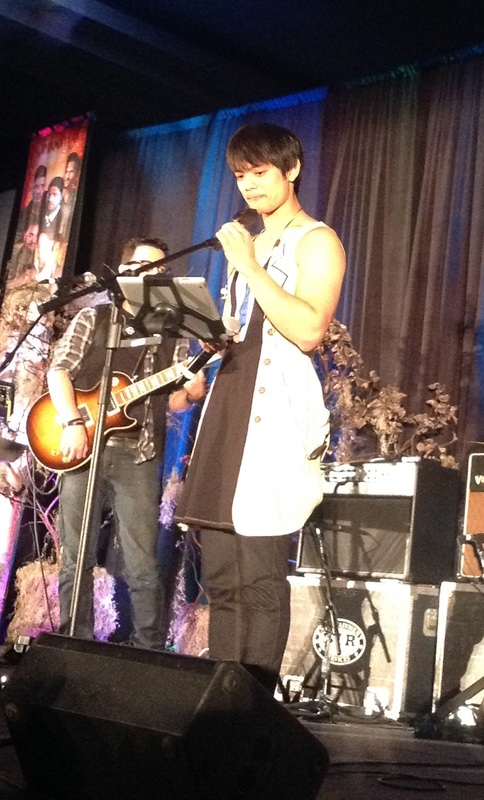 The first time Osric’s voice broke as he sang, I started to tear up. 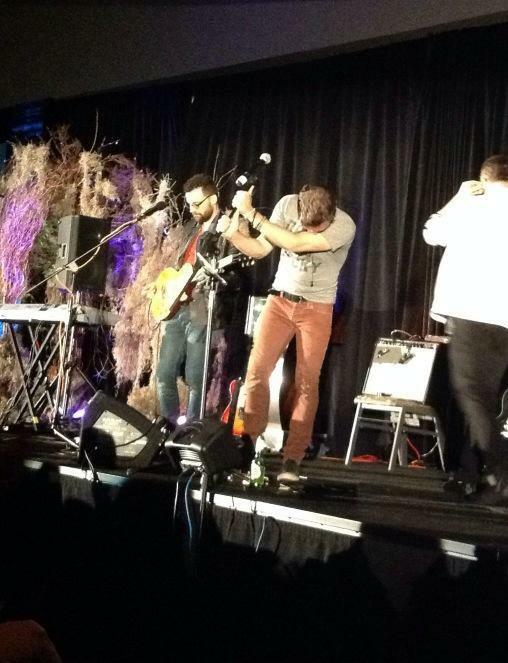 By the time Osric was choking back tears himself, and then letting them fall, I was right there with him. So was most of the audience. Rob was immediately right there, a hand on his back, an arm around his shoulders, saying it’s okay, you’re safe here, you’re with family. In fact, everyone gave him a hug. That just made me sob harder, but it was the best kind of crying, shared with a room full of people who were feeling the same thing. I think I was the first “guest” that went up on stage. I saw it as an opportunity to challenge myself and do something I never thought I would ever do, play music and sing in front of an audience. By myself. It was terrifying. I can still remember Mark talking about how big my balls were for being able to just get up on stage and do something everyone knew I was so uncomfortable with. But by the 2nd and 3rd concert a couple of the other guys started stepping up to do songs as well, some just as uncomfortably. I put down my amateur guitar and started to perform with the band as well, which was another experience I never thought I would ever have. And it was the most incredible thing I could have hoped for. Mark suggested that I do ‘Creep’ from Radiohead, and so in Toronto I performed it for the first time and for some reason I hadn’t really looked at the lyrics till I read them off the teleprompter while I was performing. And then looking into the audience as well, the meanings just started smashing into my head like bricks. I completely broke down on stage and it caught all of us off guard. It was tough getting through that set, but somehow I managed. I’m better at handling it now, but I can’t get through that song, even just listening, without getting teary eyed. It’s just turned into one of those weird triggers now. To be an artist and all of a sudden have a completely new outlet to express yourself is just an incredible gift, and for that I will always be grateful for Rob and the Loudain Swain dudes. 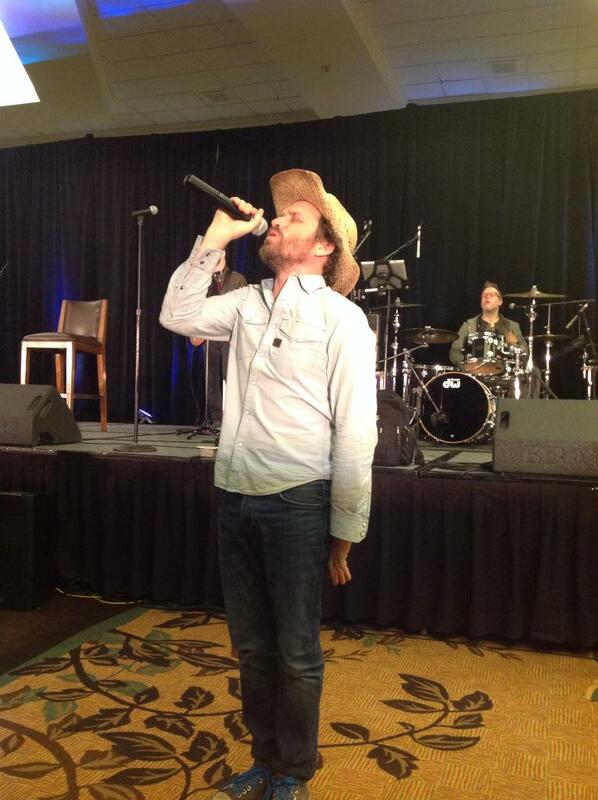 Richard sang too (who knew he could sing country tunes like that?) and played guitar. Did you know he used to have a band? 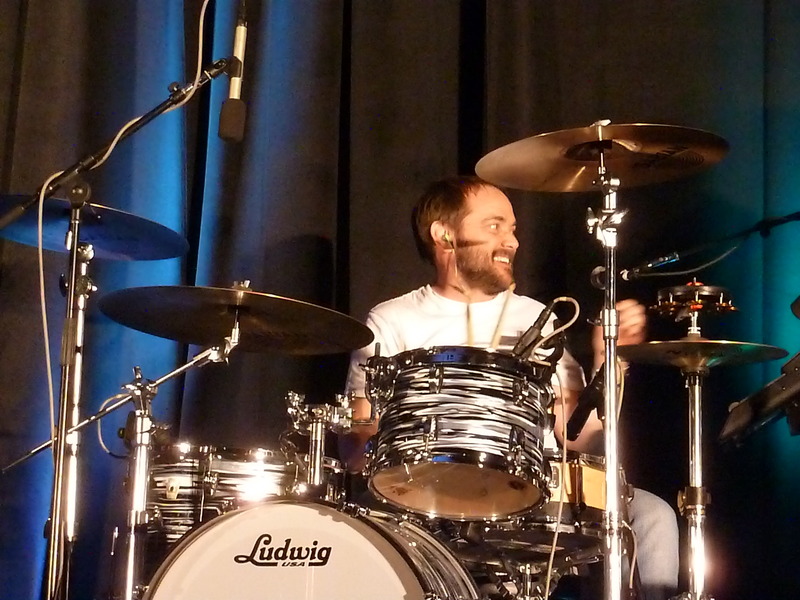 Mark Sheppard played drums and looked ecstatic to be doing so again. Creation’s super talented photographer Chris Schmelke played bass. Yep, he used to play in a band too. Creation’s Adam Malin stepped out of the role of convention organizer and into that of musician, playing keyboards. Band? Yep. You guessed it. 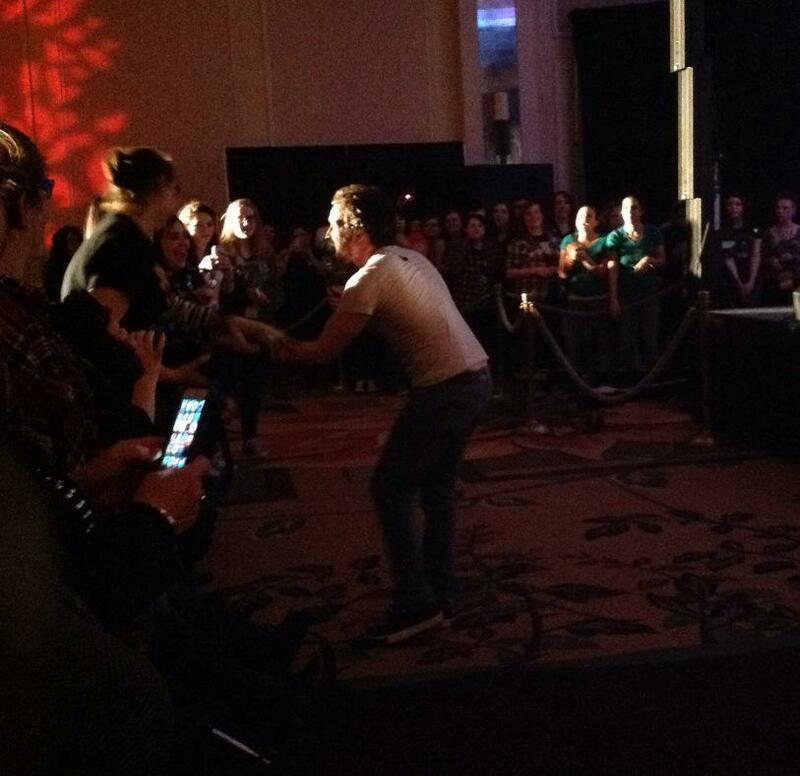 When everyone launched into “Carry On”, the room exploded, the entire ballroom of fans singing along. The fact that Rob had been unable to perform it the last time made it all the more emotional. The last song was the most emotional moment I’ve ever experienced at a convention. 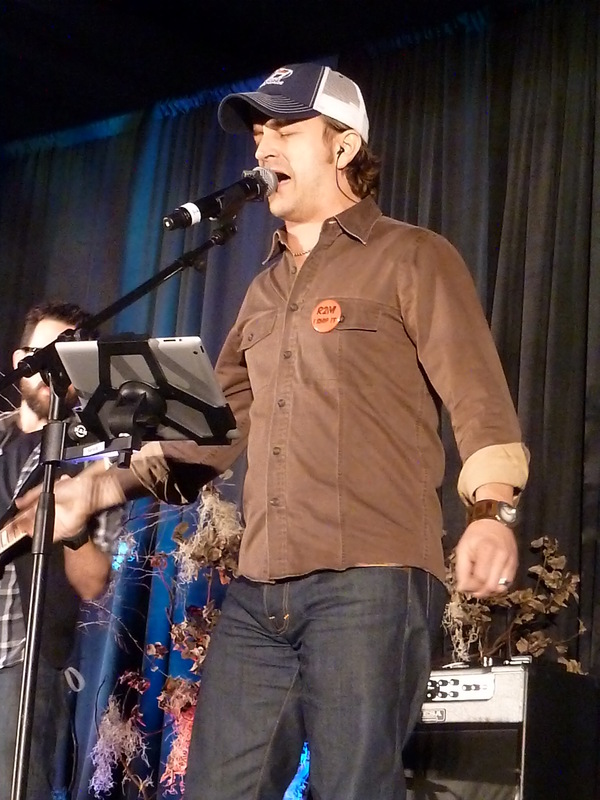 Richard Speight came onstage and gave a heartfelt speech about how grateful he was that Rob (“my friend – my brother – Robby”) is still here, still alive. About what an amazing person Rob is and how the world is a better place for having him in it. 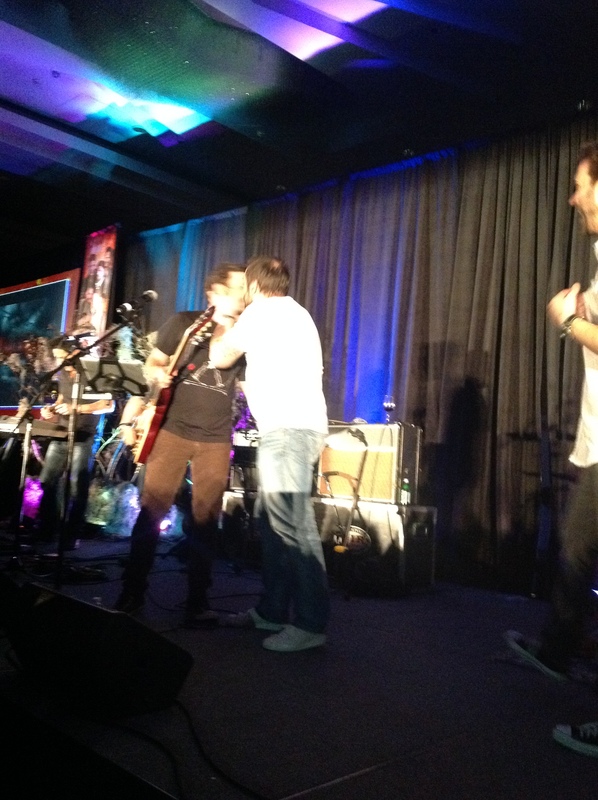 Then Rob and the band performed “With a Little Help from My Friends” with all the guests backing them up. As the cast members left the stage one by one, they all clapped Rob on the shoulder or hugged him or kissed him, and then he ended the song onstage alone, with the ballroom full of fans letting him know how much we all love him too – and how very glad we are that he’s here. That’s the kind of toothpaste you don’t put back in the tube. The Saturday Night Special, as it’s now called in 2015, has become many fans’ favorite part of the convention, with the possible exception of whenever your favorite cast member takes the stage. 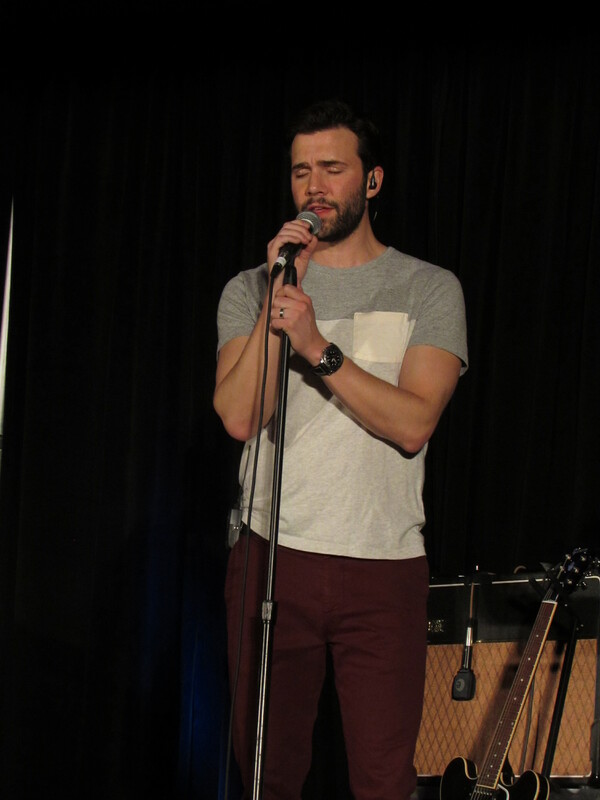 When Gil McKinney joined the convention circuit, he also challenged himself to sing onstage. Gil had done theater and been a singer, but had become discouraged and lost his confidence about performing live. 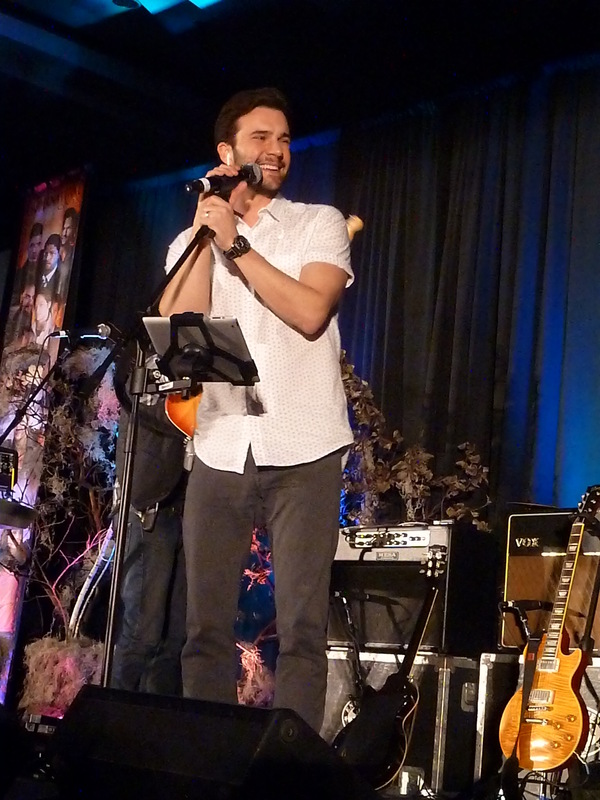 The conventions, and the support of the fans and his fellow cast members, allowed him to push aside his doubts and take the stage. And holy hell, can that boy sing! I think the Saturday Night Concert is special because of the overwhelming support we get both backstage and from the audience. It is rare to find such a talented group of people encouraging one another to strive for greatness! It is. In ‘show business’ perhaps more than anywhere else. Whoever is a guest at the con now joins the show on Saturday night. 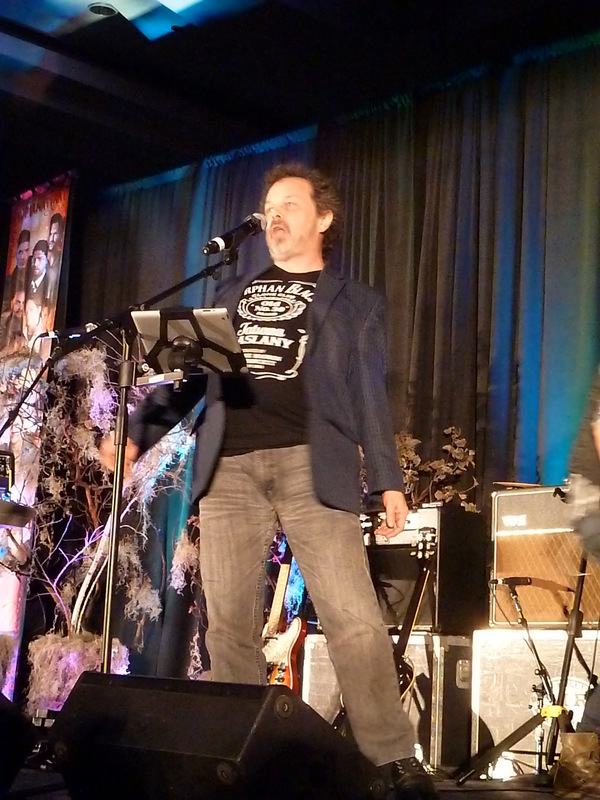 Curtis Armstrong and Alaina Huffman and Britt Sheridan and Mark Pellegrino and so many others have all been back-up singers for the band. Creation’s Stephanie Dizon, with a voice like Janis Joplin, often takes a turn at the mic. 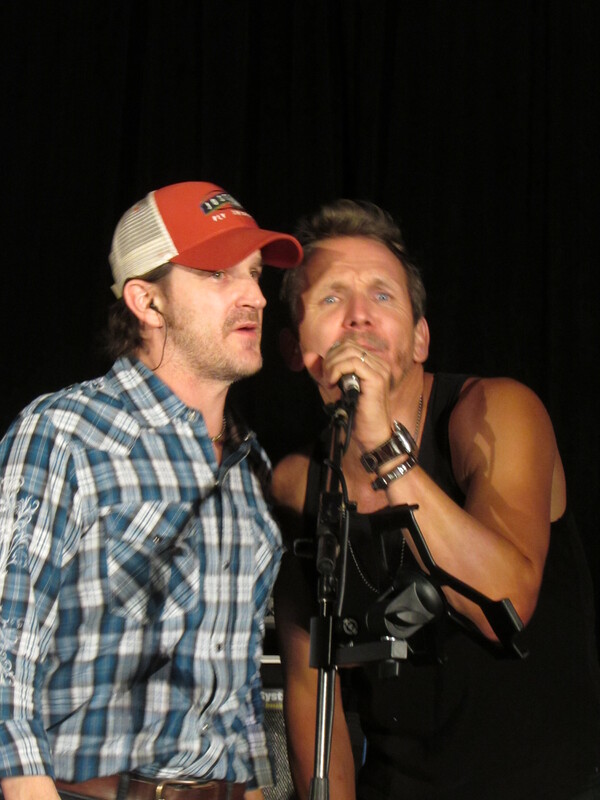 Sebastian Roche, who no one has ever accused of being shy, delights in belting out a song, sometimes standing on a chair to do it or going to his knees onstage. 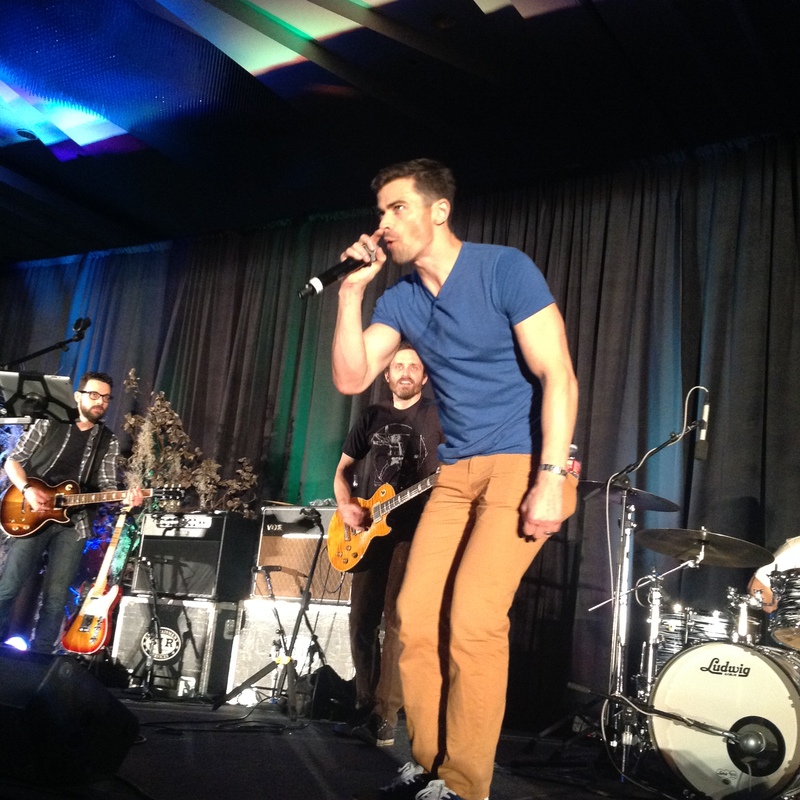 Matt Cohen, who had never thought of himself as a singer, now takes the stage like a rockstar, belting out “Blister In The Sun” and getting the whole ballroom singing along. What was formerly known as the Saturday Night Cabaret has been transformed into something that all the actors and of course Louden Swain, can consider an artistic rock/pop show that we are all passionate about. It is the reason to look forward to Saturday night for both the fans and the actors. I am not one to strut my singing skills (or lack of), but to get up on that stage and step out of my comfort zone to give the fans a great memory is truly worth it. I walk around giddy all day looking forward to the Saturday Night Special. Kudos to the master minds behind it and the always generous Louden Swain. 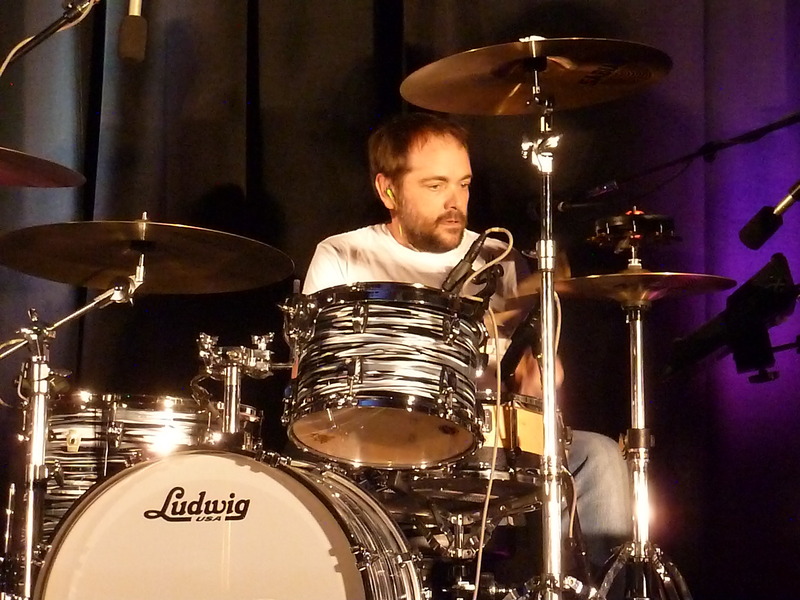 Mark Sheppard, an unbelievably talented drummer, is always a driving force behind the scenes and onstage. He’s a musician from way back, and seems to relish being back in it. Thousands of people fall silent when Richard, Rob and Louden Swain sing “Seven Bridges Road,” the five part harmony so beautiful it gives you shivers. 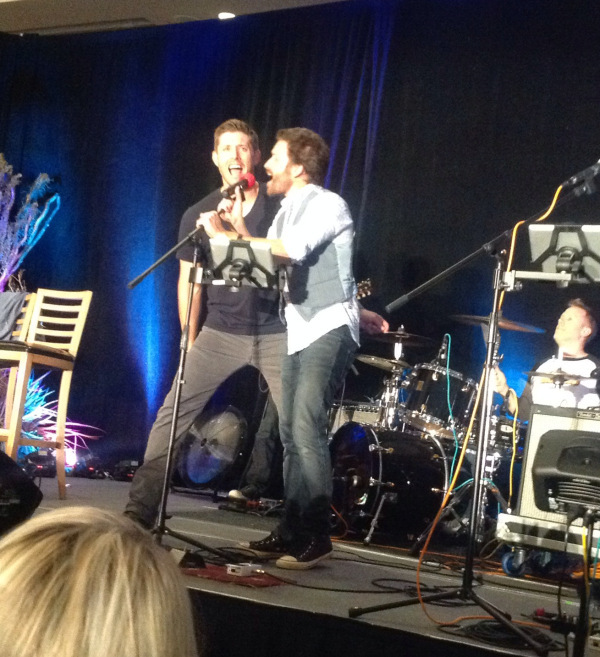 While he and Jared are unfortunately never at the con on Saturday nights, Jensen has also become more and more confident about performing for fans. 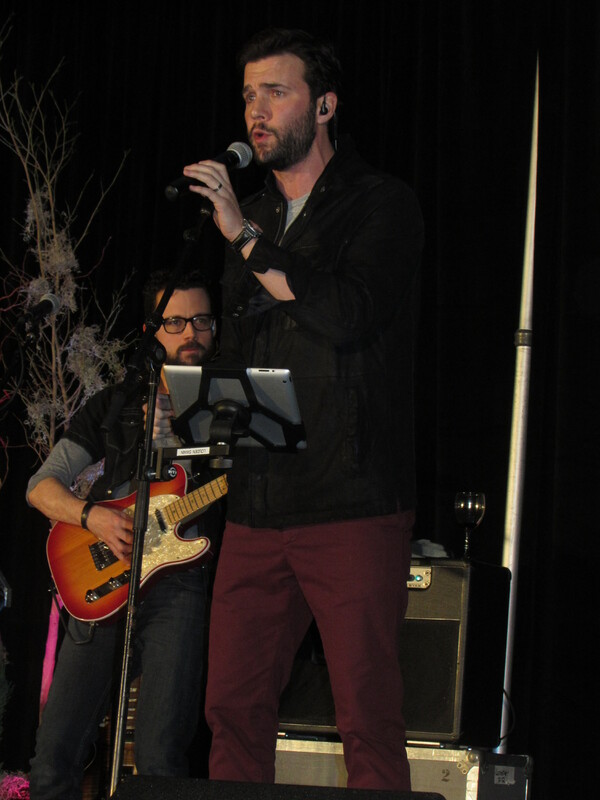 He can’t seem to resist joining in when Louden Swain is right there and there’s a microphone just waiting for him to sing lead. 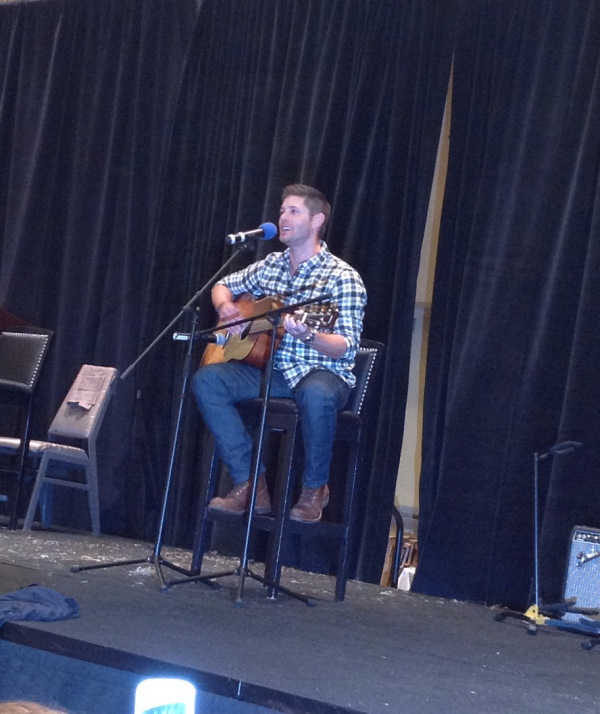 He even borrowed a fan’s guitar at a recent con and played a few songs for those of us still in the ballroom, much to everyone’s great delight. Now that Jared and Misha have appeared on Jason Mann’s Christmas CD, hopefully it’s only a matter of time before they succumb to the lure of the mic too. 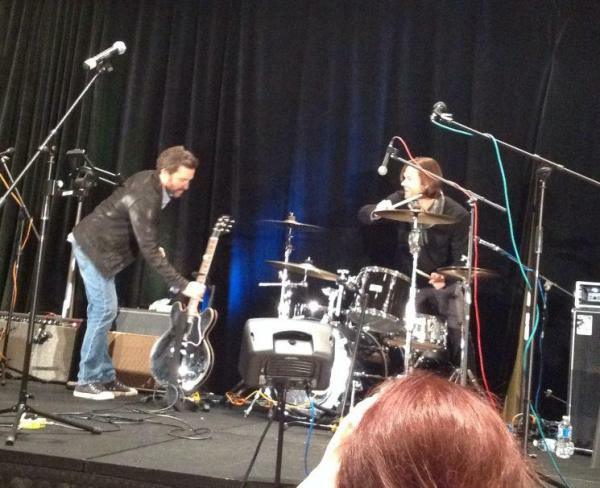 Does the casting agent for Supernatural require a musical audition as well as an acting one?? Who would have expected so much musical talent in virtually the entire cast? 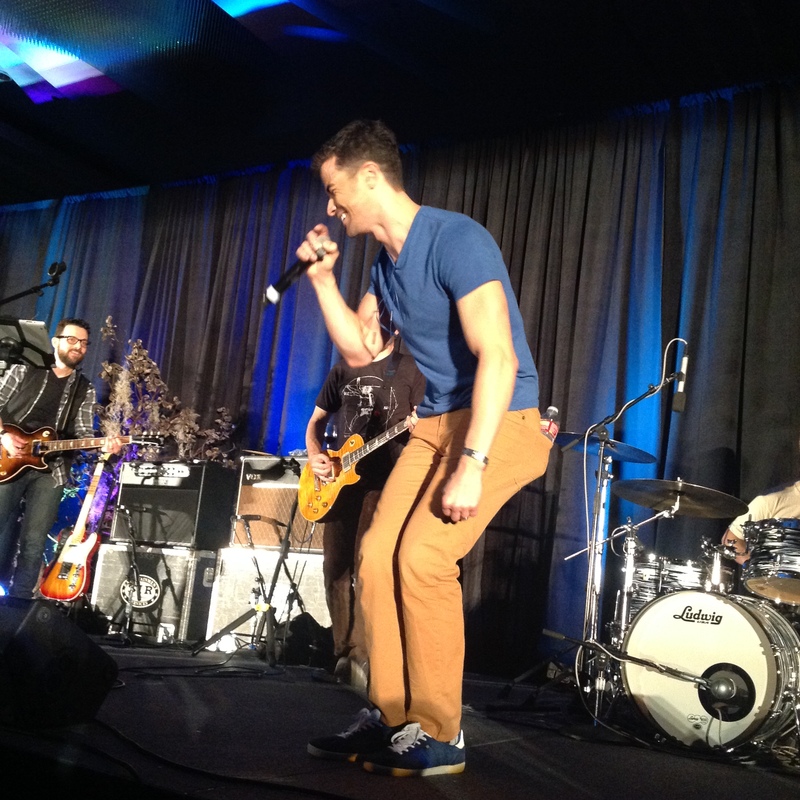 Misha has sung backup a few times, and Jared has been known to take to the drums (or beat up on a cowbell) every now and then. The name “Cabaret” never quite fit what we envisioned for what Saturday night could be. It was more than just a cabaret– it was a celebration of family and friends. At the end of last year we came up with Saturday Night Special. This new name encapsulated what it actually was, the operative word being “special”. 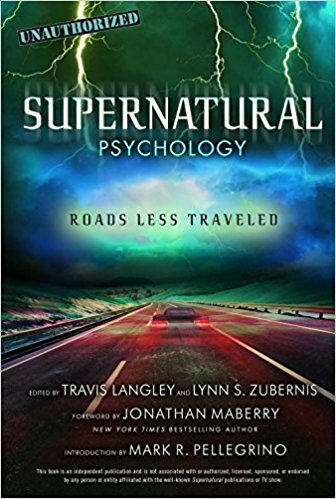 Not only was it a show which showcased the immense talents of many of the actors of Supernatural, but it was also a unique, special experience. An experience that brings together the love that we, the actors, all have for each other, and the love we all have for the fans. And for me it has become very personal. When the actors perform on stage, it feels as if they are reaching out to me, lifting me up. After what I experienced last year, having a stroke while attending a con– this is a celebration of life, of love and of friends. We always end the show with Joe Cocker’s version of “A Little Help From My Friends”- I could not think of a better song that symbolizes the moment– for me, and for all of us. Rob is such a sweet person…I saw him in Vegas after his stroke and he was truly so overwhelmed to be alive among colleagues and fans. At an autograph session I told him how well he looked and to take care of himself, he looked at me with genuine gratitude as he said thanks and that he would. Thanks for this post… it was very moving. We are the Luckiest. Fandom. EVER. Thank you for writing this! I have been going to the cons since the first Jared and Jensen one-Chicago 2007. 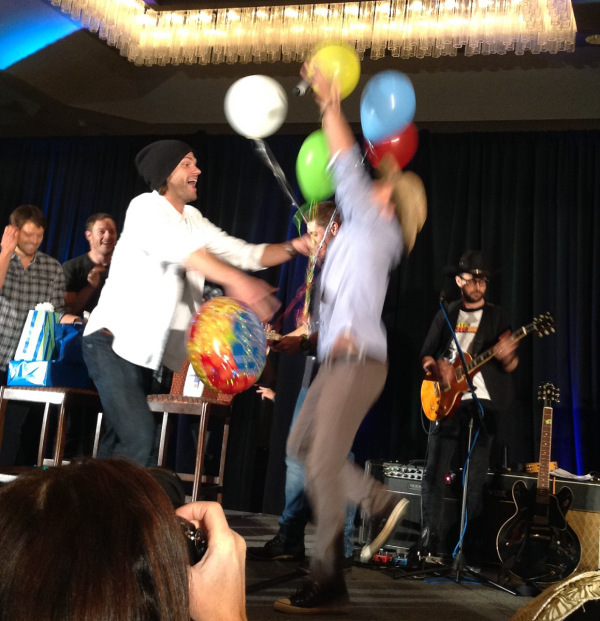 Jared and Jensen’s magic together is what started the ball rolling with wanting to attend more and more cons. All the guests would say the same thing, that because of how Jared and Jensen ran the ship, there was such a feeling of family and love. Then things started to happen. The more the actors had the chance to play together, the closer they became. With Richard at the helm and Rob with his wonderful band mates becoming the house band, everyone became comfortable. 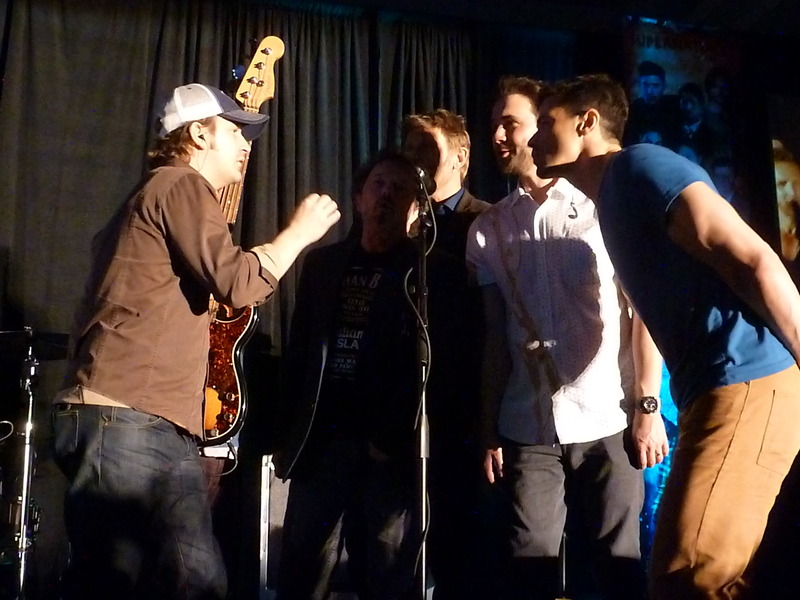 The guests would sing and play along with Louden Swain and their alter ego, The Elastic Waste Band. We all felt a connection. We had fun because they were having fun. Plus, they are all sweethearts! They treated us with respect and love. The feeling was definitely mutual. We have become a family and when we gather together we know we are in for a great time. A great time with folks that we have come to love. Thank goodness Rob is all OK. That was a wake-up call for everyone and love was the salve that healed. 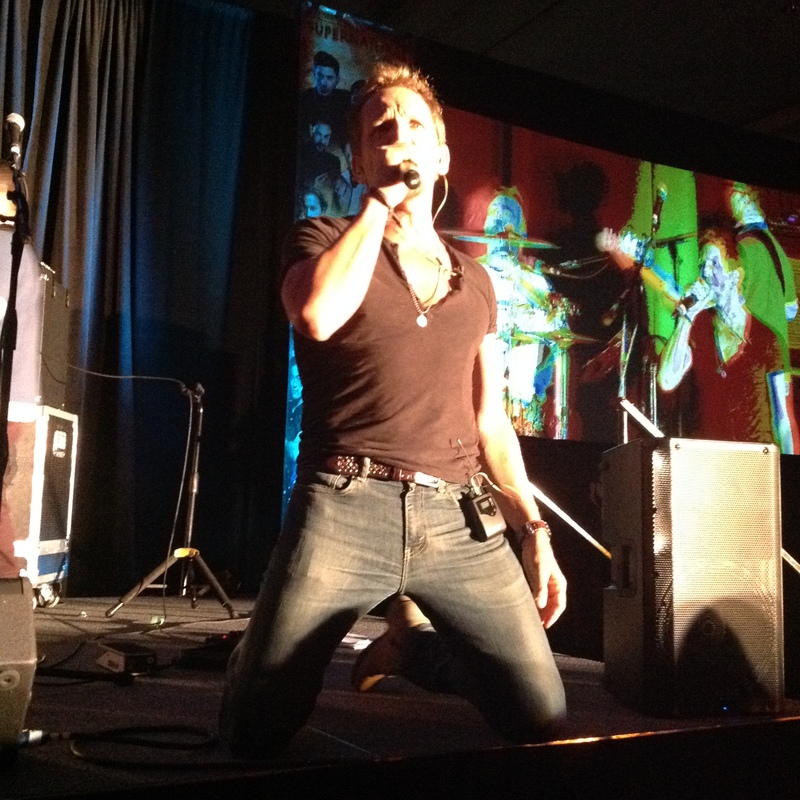 Look forward to meeting you at VanCon! All I can say is that this family is truly amazing. Thank you for this article…to say that I have tears streaming down my face would be an understatement. 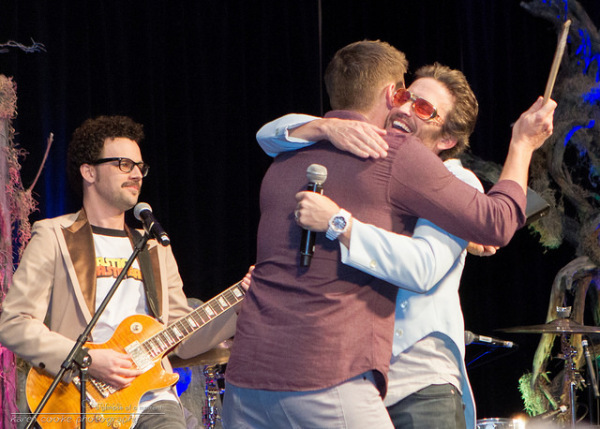 Cannot wait to attend my first convention and meet more family at #DCCon2015. 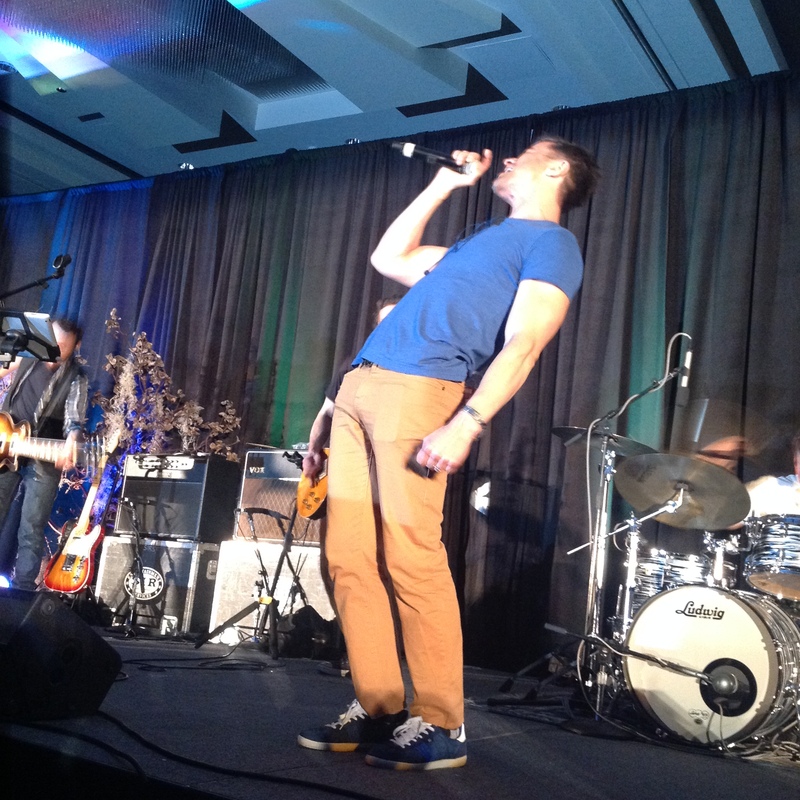 I feel lucky too – I can’t imagine any fandom experience topping this one! Dammit Lynn you always make me cry! Can’t wait for my first con! 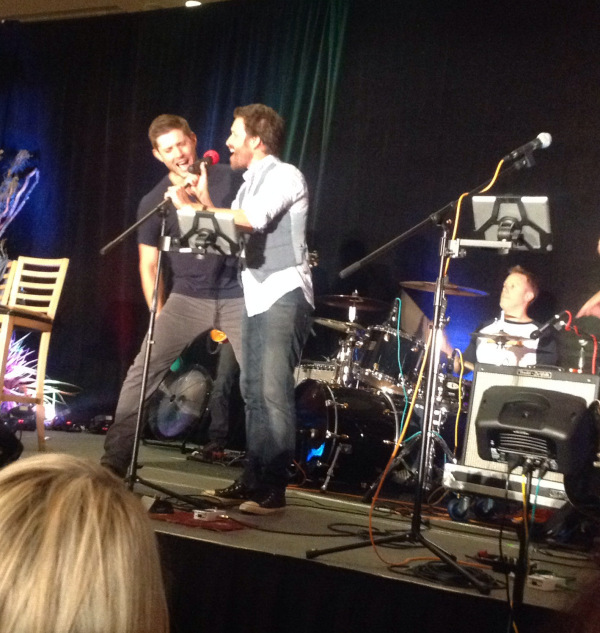 VanCon 2015! I will be laughing, crying and I’m sure forever changed. 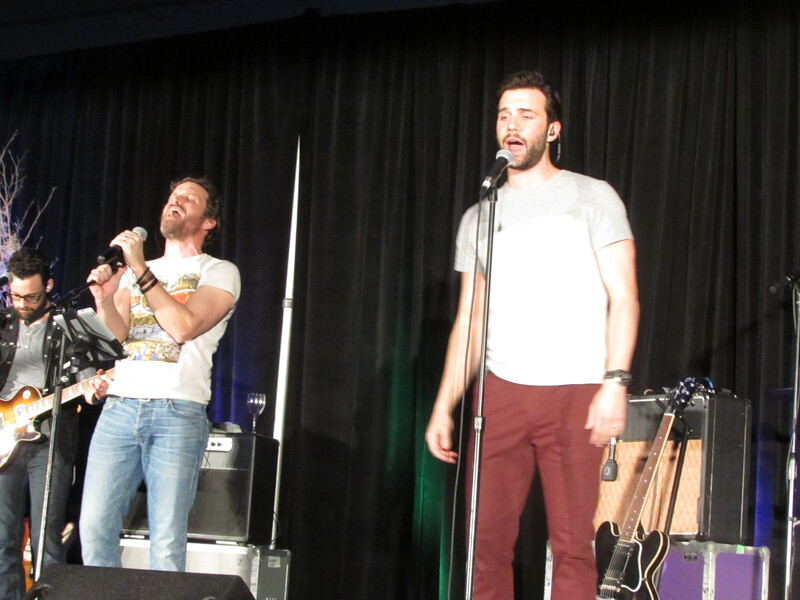 Just want to say thank you Lynn for all your pics, tweets and stories from the cons. It is so wonderful for those of us who can’t attend to be able to share in a little bit of all that awesomeness. Hugs! Thank for writing this. I have not had the pleasure to be at a convention, but I love hearing the stories and seeing the pictures. 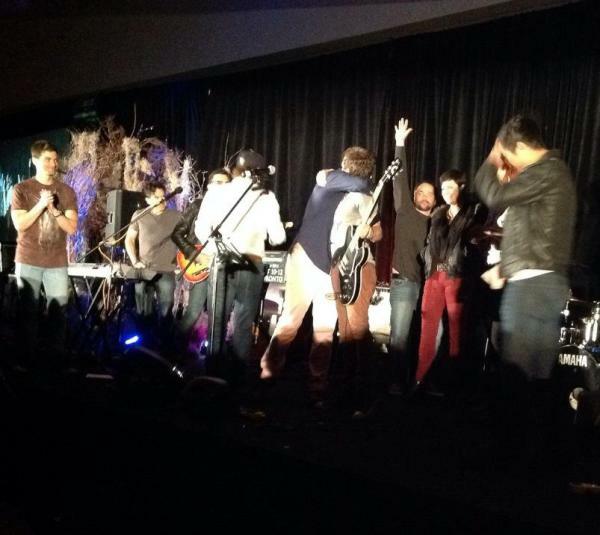 It looks like one giant family reunion. Thanks again. Thanks again for the great review of the Convention. 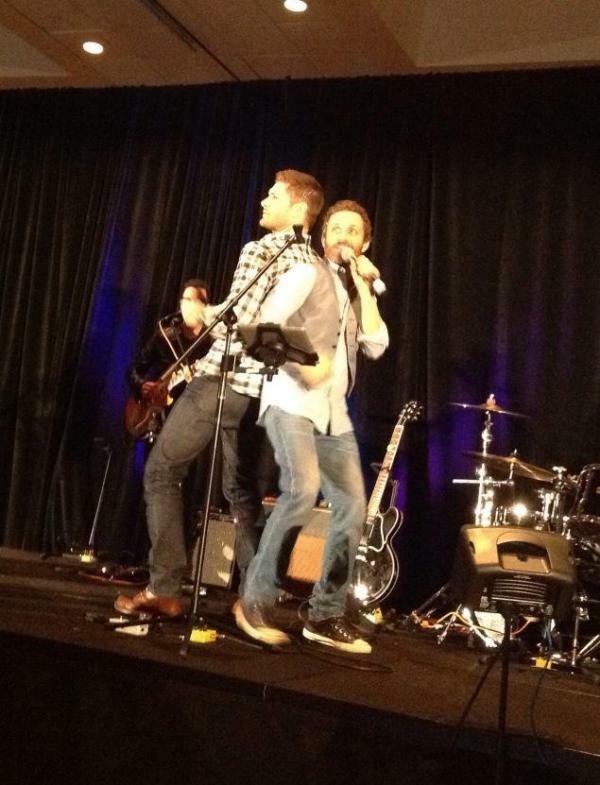 It seems like the actors have as much fun as the fans. Looking forward to Vancouver! It really is – hope to meet you at an upcoming con! Reblogged this on Free Range Idiocy. I have tickets to attend the one that’s held next weekend. I didn’t know too much about it, but after reading this… I’m very excited to attend this. Thank you for enlightening me about this wonderful meaning behind the concert. Taking my daughter to Phoenix next weekend for her sweet 16…so excited and glad to be able to experience it. I have never been to a convention, although thanks to YouTube videos I can kind of feel like I’m there sometimes. This made me tear up. 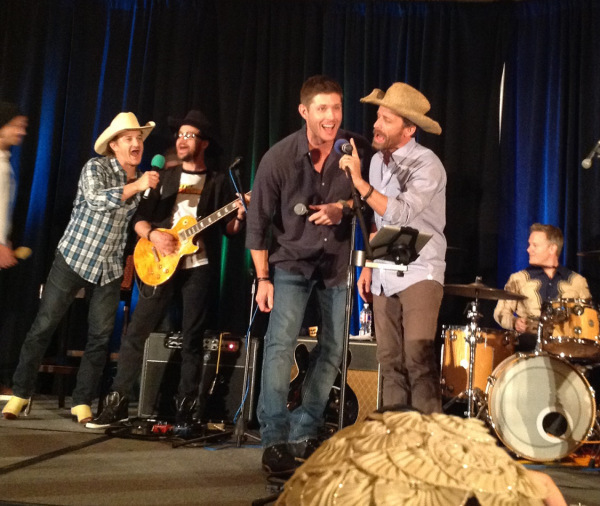 This is the SPNFamily that anyone on the outside has no idea about. This is why Supernatural fans are so unique and the best ever! Thank you for this, it’s been the music that really got to me when I started watching con videos, and I had decided if I ever went to one, I’d go just for the Saturday Night Special if that was all I could afford. The “mystery of Gil” was solved for me here too. My sister trained with a choral group in college, she has a great voice, and I recognize the difference between someone who can sing pretty good and a really great set of pipes! He and Rob together are magic. When either one of them tips back their head and just opens their throat to pour it out, it gives me goose bumps and tears. This also confirmed for me what I thought I was seeing, but couldn’t really be sure of…that the cast loves getting on stage and playing “rock star” as much as we love seeing it. It must be hard as an “actor” to find a safe place where you can play around and try other things, some of them do try, but at these cons they can do it without the world criticizing every move. The audience is accepting and loving.